Compatibility with a variety of image formats: JPEG, BMP, GIF, PNG and TIFF. 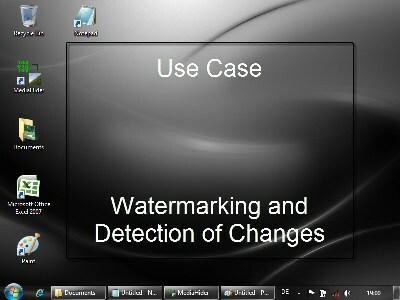 Support for arbitrary data & watermark files. Innovative modular data hiding methods which allow you to select the right protection for the right application. Basic data protection by two leading encryption standards: TripleDES and AES. Additional data protection by specialized data hiding security routines. 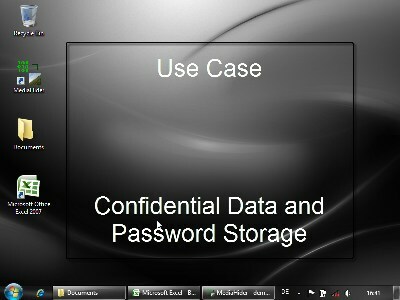 store your sensitive private information such as passwords, credit card numbers, project files, telephone numbers, etc. in a most secure and unobtrusive way - namely in the image files of your choice. In this way, intruders first have to find out where your data actually is, before they can try to decrypt it. communicate with your business and project partners, friends, relatives, etc. via the Internet or other insecure communication channels and you do not want to expose the fact that you are communicating at all. 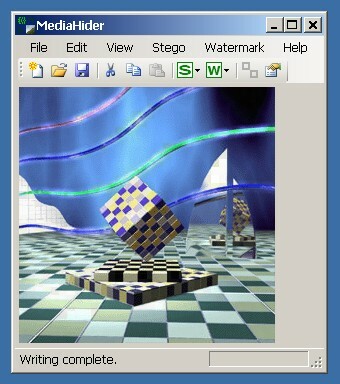 MediaHider lets you communicate by image exchange - you can upload/download the images containing your private communication to/from public forums, company blogs & websites, social networks such as Facebook or MySpace or even your Skype profile. Thus, nobody knows that you communicate! watermark your photos before you distribute them over the Internet or other communication channels. MediaHider lets you hide a invisible watermark in your photo files, which proves your authorship if others steal your image. It is resistant to image manipulations and can survive JPEG compression, decompression and recompression by general-purpose image processing software such as Adobe Photoshop, GIMP, IrfanView, Microsoft Paint, etc. protect your image files - important documents, contract agreements, forensic and surveillance photos, passport photos, etc. from accidental changes or malicious forgeries. MediaHider can detect modifications made to your photos and it can show the exact regions that have been modified or forged. Thus, you know which parts of your image are genuine and which are not (possibly due to retouching in Photoshop). discover the source of information leaks. MediaHider lets you hide data (a name or some other identificator of your choice) identifying the recipients of your image files. When the image files have leaked out, you can trace the leak to its source by means of the identifying data embedded in the leaked image copy. attach any kind of meta-data to your images in a secure and loss-resistant way. Meta-data hidden by MediaHider always remains with the image. It may describe the image file, contain a license agreement for its use, point to the image homepage on the web, etc. Thus, it may be used to prevent image theft and phishing of websites, it may help distribute similar images to customers and it may bring order to image classification in corporate infrastructures - the possibilities are limitless. In this section, you can see some videos and screenshots showing the MediaHider in action. 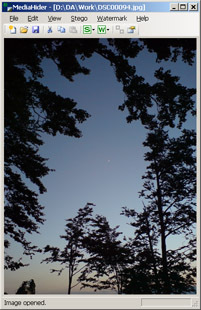 The demo version works with only two predefined images: a standard test image known as "Lena" and a photo. The Paste operation is disabled. The Drag&Drop functionality is disabled. If you like MediaHider and want to remove the aforementioned restrictions, you can purchase a registered copy which works with any image of your choice. If you want to buy a full license for MediaHider, please contact us.